Following an official announcement at a media event last week, Apple today released iOS 8.1, the first major update to iOS 8, which was originally launched in September. As Apple's Craig Federighi noted last week, Apple uses the launch of major new versions of iOS to collect “feedback” and quickly release bug fixes, address questions and concerns, and ship improvements that didn't make the cut for the first release. iOS 8.1 brings bug fixes, speed improvements, and interface changes, but it also enables Continuity features such as Text Message Forwarding and Instant Hotspot, allowing iOS devices to better integrate with each other and Macs running OS X Yosemite. With iOS 8.1, Apple is opening access to its iCloud Photo Library beta – an iCloud service that stores all your photos from all your devices, in a single library that relays changes to every device. And last, iOS 8.1 marks the debut of Apple Pay, the company's new payment service that rolls out in the US today. iOS 8.1 is available through Software Update now. You can find a list of the most notable changes below; you can read our previous iOS 8 coverage here. There is a new “Enable Dictation toggle” in Settings > General > Keyboards. This allows you to toggle dictation for the Apple keyboards that you have enabled in the Settings. The Camera Roll makes a comeback in iOS 8.1, replacing the highly criticized “Recently Added” photo album. With iOS 8, Apple changed the behavior of the Photos app, removing the Camera Roll in favor of an album that displayed “the photos and videos added to your device in the last 30 days, organized by date” (Apple support document on the feature). The change wasn't well received by iPhone and iPad users, and iOS 8.1 brings back the traditional Camera Roll (all your photos, in chronological order) under Photos > Albums. 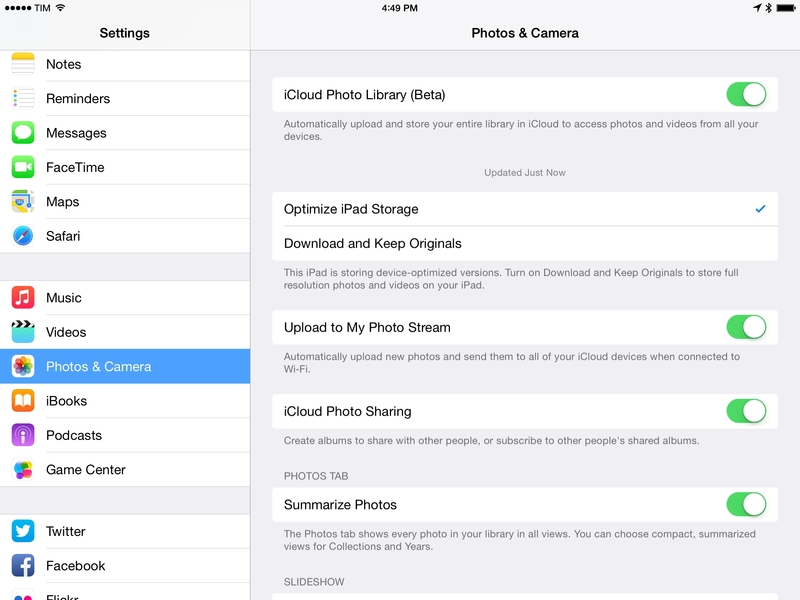 iCloud Photo Library can now be enabled as a beta in Settings > Photos & Camera. iCloud Photo Library automatically uploads and stores all your photos and videos on iCloud, allowing you to view them and edit them on any device. Every photo and video you take now lives in iCloud — giving you the freedom to access your library from any device, anytime you want. So you can view a photo from last week or last year no matter where you are. There are two settings for photos: Optimize Storage and Download and Keep Originals. The former will store device-optimized versions of your photos in the Photos app; tapping them will preview them by quickly downloading a higher-res version. The latter stores full-res versions of photos locally, consuming more storage space. Once enabled, you'll be able to find a web app for iCloud Photo Library at beta.icloud.com/#photos, which allows you to view and manage photos from a web browser. With iCloud Photo Library turned on, the Camera Roll album becomes All Photos. iOS 8.1 enables the Text Message Forwarding feature (also known as SMS Relay) that was first announced alongside iOS 8 and OS X Yosemite at WWDC. Once enabled on an iPhone and other devices signed into the same iMessage account, this feature allows you to send and receive SMS text messages on any device. It means that you'll be able to reply to SMS on your Mac or iPad, using your iPhone as a relay hub. 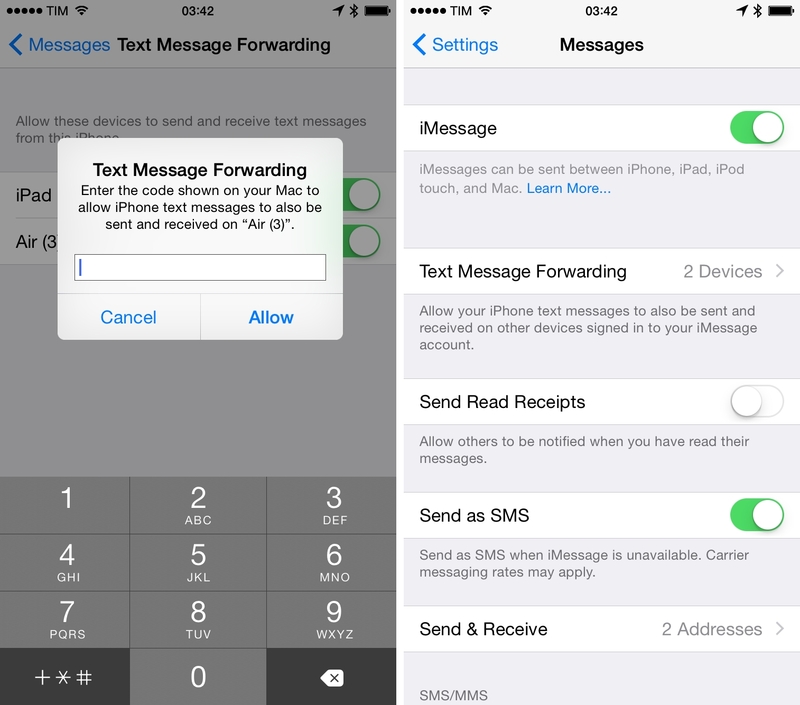 Once installed and if you're signed into the same iMessage account with other devices, iOS 8.1 will ask if you want to enable Text Message Forwarding from your iPhone. A code will be displayed on your iPhone and you'll be asked to enter it on devices such as an iPad or Mac. After enabling Text Message Forwarding, your non-iPhone devices that wouldn't otherwise be capable of sending regular text messages will be able to send and receive SMS through your iPhone in the Messages app. You can see devices you've enabled for Text Message Forwarding and disable the feature on your iPhone by going to Settings > Messages > Text Message Forwarding. 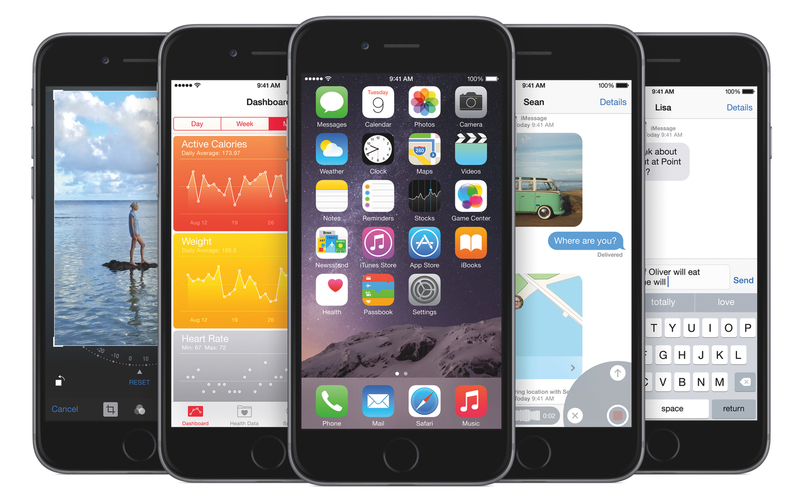 For more information, check out our guide on iOS 8.1 and Continuity here. With Instant Hotspot, you can now connect (tether) to iOS devices without having to manually enable Personal Hotspot first. Simply make sure that all your devices are signed into the same iCloud account, and, for instance, your iPhone will appear as as an option in the list of WiFi connections on your Mac. 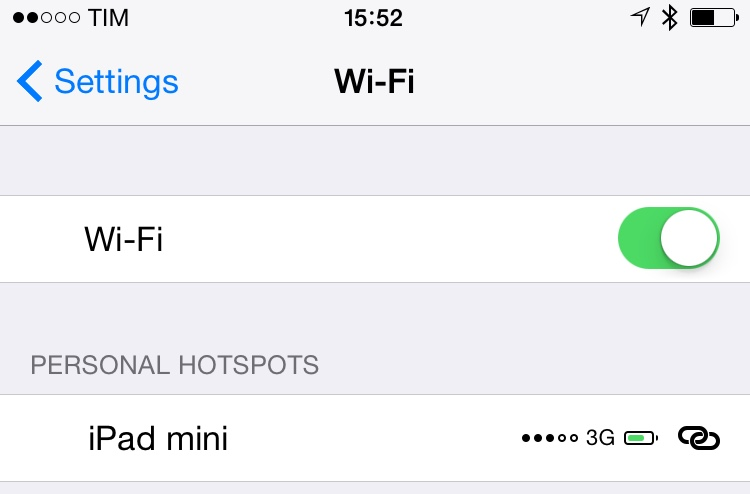 The same applies to iPads and iPhones – go to the Settings app, open the WiFi page, and you'll see Personal Hotspots from your devices even if they don't have the Personal Hotspot toggle set to on. You'll be able to instantly connect to them without typing a password because iCloud is authenticating you across all your devices. A nice detail of this feature is that you can see the signal and battery level of the hotspot device directly from the connection's screen. The interface for third-party app settings in the Settings app has been slightly tweaked. 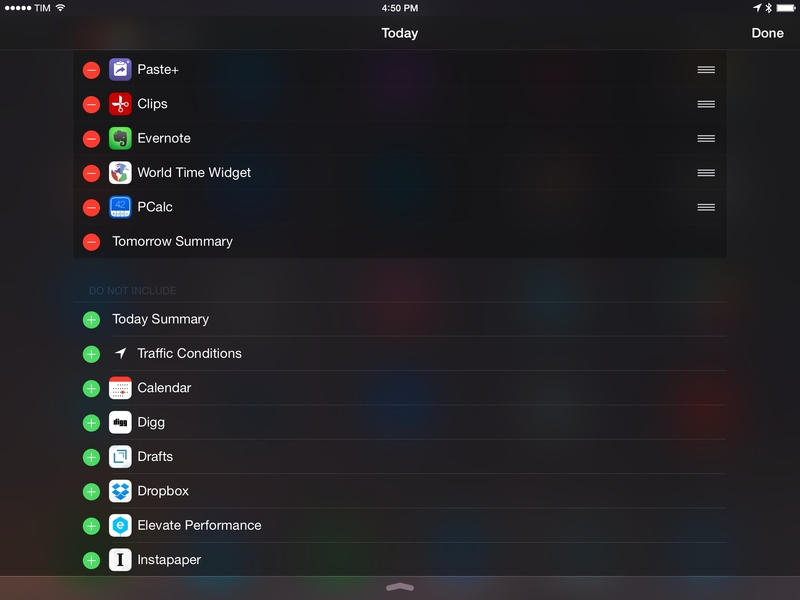 When in editing mode, the app icons for available widgets in Notification Center are slightly larger now. Apple Pay has been enabled in iOS 8.1, allowing users of iPhones and iPads to pay through their credit cards configured with Apple Pay and Passbook. The feature is limited to the US for now, and it'll work with various NFC terminals and apps. You can ask Siri to show your credit cards (Passbook should open), and you can learn more here. iBooks has a new icon, matching the marketing materials and screenshots from Apple's website. The “My Photo Stream” album is also back in the Photos app under Albums.